Sunshine Kelly | Beauty . Fashion . Lifestyle . Travel . Fitness: Watsons Move Your Body - ZUMBA! Yo! Move Your Body is Back with ZUMBA this year! Are you ready to dance? Let’s get moving and burn some calories. Hey don’t be lazy lazy if you want that body. 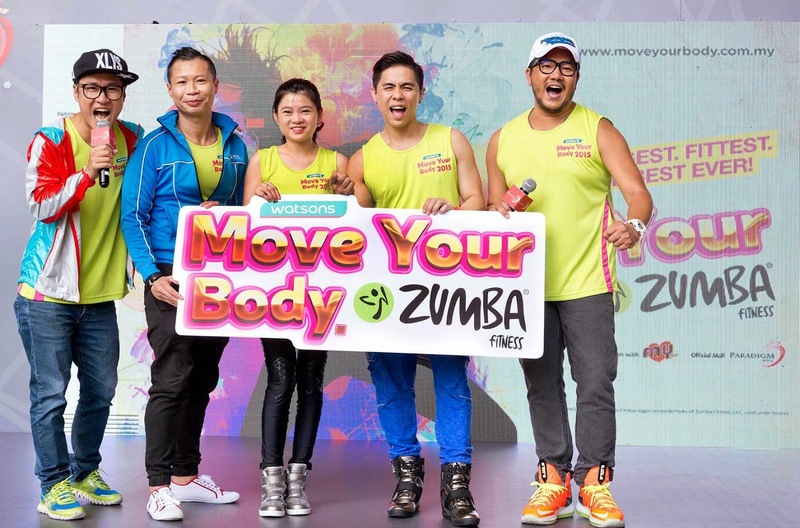 Watsons Malaysia is launching the second edition of ‘Move Your Body’ with Zumba that will be packed with fun fusion of dance moves that provides a total body workout, burns huge calories, boosts metabolism and improves cardiovascular health. It is a workout for all ages and is a great activity to release stress. In fact, Zumba today is the largest growing art form for health in the world. Move Your Body – Zumba is going to be the biggest, fittest and the best ever Zumba party in Malaysia, this event will be held at Padang Kota Lama, Penang on 7 June 2015, Sunday. A month-long campaign has been planned leading to the final event. 1. ‘Move Your Body – Zumba’ Music Video with My FM popular announcers Jack Lim and Jeff Chin, which includes Zumba dance tutorial by Zumba Fitness instructor Deno Au. 3. ‘Move Your Body – Zumba’ Rewards Pack with additional discounts and freebies would be given in stores at all Watsons nationwide, with RM80 purchase. 4. My FM radio cruisers would be teaching the public the ‘Move Your Body – Zumba’ moves. You can join the ‘Move Your Body – Zumba’ event at Padang Kota Lama, Penang on 7 June 2015, where parents and kids alike can have an enjoyable time as they join the ‘Move Your Body – Zumba’ dance session with Jack Lim and Jeff Chin. In addition, there are exciting lucky draw prizes up to RM30,000 to be won during the grand finale. The event will also include fun filled activities including Hot Air Balloon ride, stilt walkers, mingling clowns and jugglers, and Watsons health supplier booths to provide a holistic yet exciting experience on active lifestyle. You can purchase ‘Move Your Body – Zumba’ grand finale tickets at only RM35 each (RM30 if purchase 3 and above) at all Watsons Northern stores in Penang, Perak, Perlis and Kedah, and selected Klang Valley stores. Or purchase the ticket online www.moveyourbody.com.my or www.watsons.com.my. Tickets are for sale now till 7th June 2015. Each ticket comes with an exclusive Move Your Body t-shirt, RM10 Watsons cash vouchers and coupon for lucky draw and also to redeem goodies bag on the event day.